The Seattle school district tests the drinking water at each campus at least once every three years. Through early 2018, the results of those tests showed 53 percent of schools in South Seattle registered lead readings above what the district considers an acceptable level of exposure. Water sources at more than half the city’s South End schools, which serve many students of color and children living in poverty, exceeded the Seattle Public Schools’ limit for lead, according to a recent analysis of the district’s data. The Seattle school district tests the water in drinking fountains and classroom sinks at each campus at least once every three years. Through early 2018, the results of those tests showed 53 percent of schools in South Seattle registered lead readings above what the district considers an acceptable level of exposure. Since 2004, the Seattle school district's policy has been to test all sources of drinking water at each campus once every three years. What’s the district looking for? Potentially toxic levels of lead and other heavy metals. Which water sources get tested? Drinking fountains, bottle fillers, sinks and faucets in classrooms, hallways, libraries, teachers’ lounges, nurse’s offices, kitchens and other rooms. What’s an unsafe level of lead? School Board policy established a 10 parts per billion threshold to trigger remediation on a drinking water source. The federal Environmental Protection Agency's standard is 15 parts per billion. What happens to unsafe water sources? Most commonly, the district posts a sign near failed fixtures, warning students not to drink from them. The district also disables or replaces drinking-water sources with high lead readings, installs filters on individual fixtures or distributes bottled water. And the environmental risk isn’t limited to children in less-privileged neighborhoods: Elevated levels of lead appeared in tests at 36 percent of schools in whiter and more affluent North Seattle schools. The district posted a sign near the fountain, warning students not to drink from it. A similar sign was posted near a fountain with a lead reading of 17 parts per billion in a locker room at Memorial Stadium. The district said, though, that the fountain is in a space set aside for the Reign FC, a professional soccer team. Since The Seattle Times began asking questions about failed fixtures, the district has updated the results for certain schools, including Green Lake, on its website that shows water-quality test results. The page for that school now lists the fountain as disabled — it’s unclear when, exactly, the district shut the flow. As of Thursday, the district was still modifying data. It also recently added language to its website saying it does not consider sinks to be drinking-water sources. 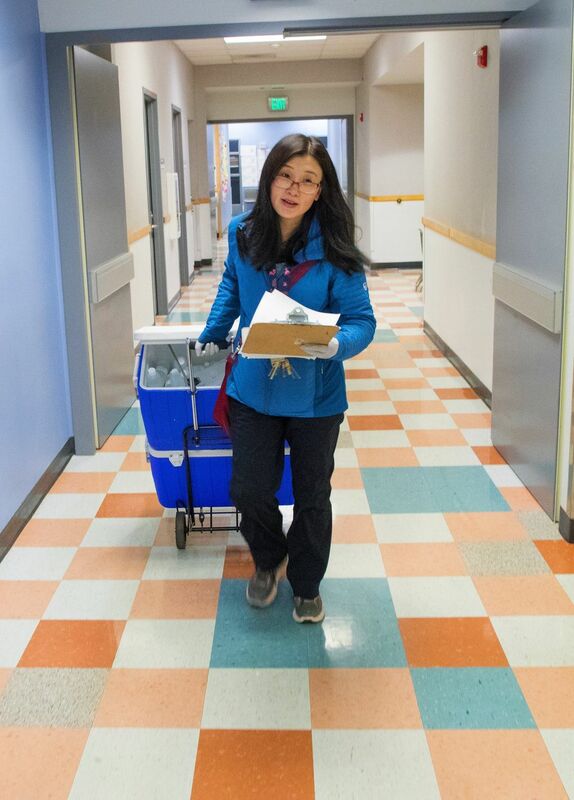 The Seattle school district, once considered a pioneer for its water-quality program, publicly boasts that 99 percent of the approximately 4,000 water fixtures across its campuses test safe for lead. While that may be true, it’s only an average — one that masks the wide disparities between individual schools. At Broadview-Thomson K-8, a school that straddles the Broadview and Bitter Lake neighborhoods in North Seattle, a full third of water sources tested above the district’s threshold. Sixty percent of Broadview-Thomson students come from low-income households. Across Interstate 5 at Cedar Park Elementary, where 1 in 4 students live in poverty, none of the water sources failed the district standard. Lead poisons everyone, but particularly children, whose growing bodies absorb lead more readily. Elevated levels of lead, according to the Centers for Disease Control and Prevention, can damage kidneys, blood and nervous system and eventually progress to coma, convulsions or death. For children, lead exposure can lead to learning disabilities and behavioral problems, too. While lead is no longer used in paint and plumbing, the risk of exposure for children remains in millions of older homes and schools. No level of exposure to lead is safe for children, according to the American Academy of Pediatrics. The tricky thing is that cities, districts, states and scientists all set wildly different standards for how much can be tolerated. Lead contamination works like a tea bag: As water stagnates in old plumbing or drinking fountains, it absorbs more lead and strengthens in toxicity over time. In Seattle, after public outrage over contaminated water in 2004, the district settled on 10 parts per billion as its threshold. Blakeslee’s research, however, revealed that as of early 2018, 41 schools and Memorial Stadium had at least one water fixture that failed to meet the standard. The district’s own data show the total tally of failures ranged from as few as one sink at Meany Middle School in Capitol Hill to as many as 26 water sources at Broadview-Thomson. Richard Staudt, who oversees the Drinking Water Quality Program, rejects Blakeslee’s analysis, even though her work relies on the district’s own data. Staudt said the overall rate of failures shouldn’t concern parents, even if one drinking fountain at their children’s school tests above the district’s limit. What we don’t know is whether and how much lead in is the water that courses through bathroom sinks, which Seattle Public Schools does not test as a matter of policy. There’s no clear national standard for whether testing there is necessary. In the neighboring Bellevue School District, bathroom sinks are tested for lead. In New York City, the nation’s largest public school district, bathrooms are tested. In Chicago, bathrooms aren’t tested. Staudt says the Seattle district posts signs in bathrooms telling students not to drink the water. Do you attend Seattle Public Schools? Are there signs in your school’s bathrooms warning you to not drink from the sinks? Either way, send us a photo at edlab@seattletimes.com. An informal survey Thursday and Friday found that nine of 11 schools had bathrooms without signs. There was, however, such a sign in the central district office. Other school systems have taken recent steps to reduce lead levels in their communities. In California, Berkeley Public Schools committed itself to removing any water fixture that tests above 1 part per billion, the pediatrician-backed limit. The San Diego school district recently won a wide margin of support from voters to spend millions in bond money to similarly get as close to zero parts per billion as possible. Far from the West Coast, Chicago is piloting another solution: There, a facilities worker invented a cheap, automatic flushing system that schools could adopt to provide cleaner water for students without spending much more money or energy. In 2004, reports of contaminated water prompted Seattle Public Schools, the state’s largest district, to test the drinking fountains and faucets at each school for the first time. The tests revealed dangerous levels of lead in a quarter of all fixtures, convincing the School Board to adopt a sweeping testing and remediation plan that set a stricter threshold for action than even federal agencies recommended at that time. Even now, only 15 states have any policy on testing for lead in schools, according to researchers with Harvard University. And of those, just 10 actually have a program in place to implement the policy. While Washington has a testing policy, it doesn’t fund or implement it. Blakeslee currently works on national corporate partnerships for Teach for America but, in addition to her work at the UW, has researched water quality in Central and South America. For her Seattle schools analysis, Blakeslee used the geographic boundaries between North and South Seattle defined by the Road Map Project, a coalition of South King County schools and districts. Since Blakeslee reviewed the Seattle data, the district has updated its website with more recent water-quality test results. 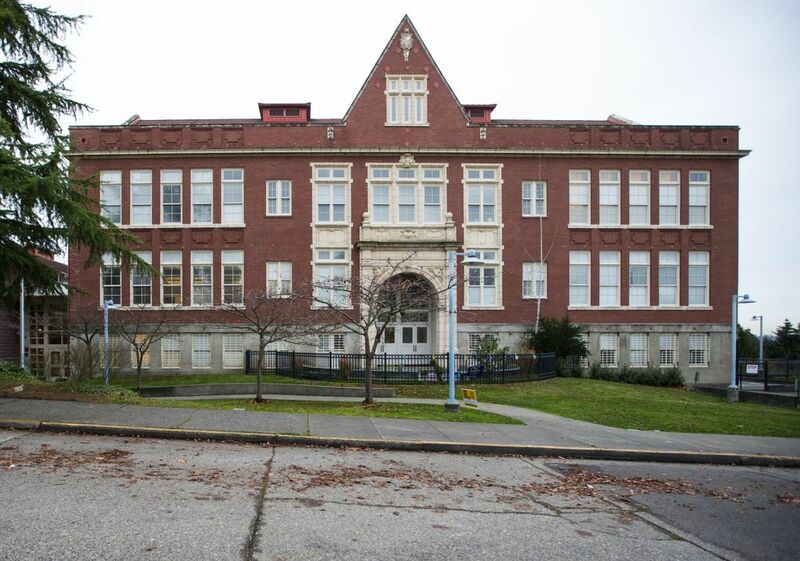 The number of failures decreased at some schools, such as Interagency, an alternative school in Columbia City, but increased at some campuses, including Madison Middle School in West Seattle. For water-quality expert Erica Walker, that Seattle even had a point person for its program was worth applauding. Walker, who oversaw a statewide lead-testing program in Indiana, said many schools haven’t even started looking. For some districts, Walker said, removing an infrequently used faucet in the classroom will take care of the problems. Other districts may need to update an entire building’s infrastructure. Seattle, however, doesn’t make it easy — or clear — for parents to know what problems are found at their children’s schools. Navigating the water-testing results for each school requires parents to decipher industry terms like “bubblers” (water fountains). The results often don’t specify which heavy metals the tests identified, and when the tests occurred. Some individual schools’ results appear on the wrong pages. And in the case of Ballard High, the remediation status for a failed fixture remained listed as “pending” for years until The Seattle Times asked about it. Staudt said multiple parents have told him they find the site accessible. After the Times asked about the data, the district added new language to its site stating sinks are not considered drinking water sources. The water crisis in Flint, Michigan, led people in nearby Chicago to wonder about the safety of their own water. At the height of Flint’s public reckoning in 2016, Rob Christlieb, senior manager of construction for Chicago Public Schools, said he and his bosses realized they had a problem: The district hadn’t tested its own water in at least two decades. That spurred an initial round of random tests at 32 schools, all but one of which returned all-clear results. Several fountains at the 32nd school, an elementary campus on the South Side, tested well above the federal standard of 15 parts per billion. “That really lit the fuse,” Christlieb said. As testing expanded to all Chicago schools, the district started experimenting with different fixes: Removing and replacing all lead-positive water fixtures; installing water filters and even new systems to pull fresh water into a school; flushing all potable water through an entire school. Those fixes weren’t cheap — the district spent about $120,000 at the South Side elementary school. But at Von Steuben High, staff engineer Michael Ramos started tinkering. “I kind of just took it upon myself to do everything I could to prevent the students in my building from being exposed,” Ramos said. For Ramos, it boiled down to one question: What could be done — on the cheap — to help facilities workers like himself keep children safe? In his spare time at home, Ramos tried to answer this question as he researched the effects of lead poisoning on children. Ultimately, he invented the answer himself, creating “Noah,” a palm-sized computer board that automatically turns on and flushes the water in drinking fountains for 30 seconds every two hours. He demonstrated Noah during an October visit to Orr Academy, a school on Chicago’s West Side. Water-quality tests conducted there in October 2016 found lead levels as high as 530 parts per billion — more than 35 times above the suggested federal limit. 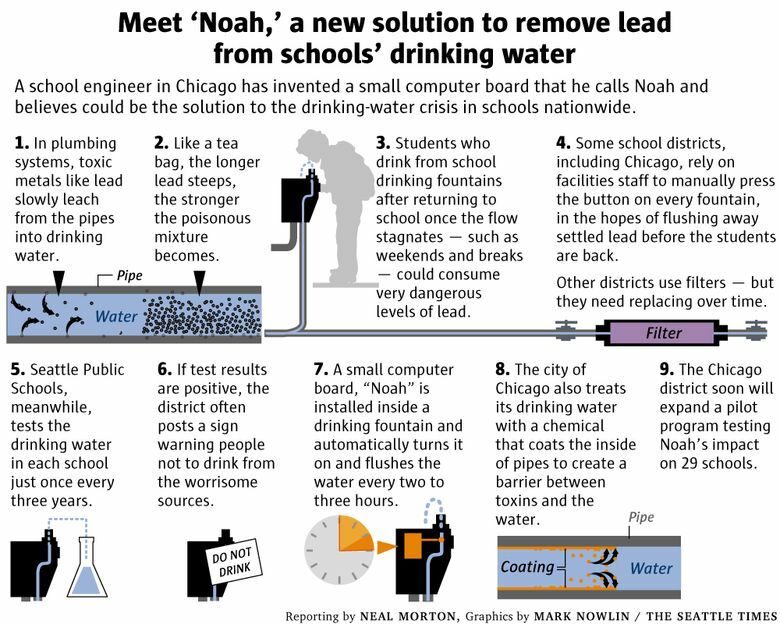 But last year, after Ramos installed Noah on drinking fountains, the amount of detectable lead at Orr had fallen below 2 parts per billion. At Orr, the devices save the school’s facilities staff about two hours every Monday morning from manually flushing the drinking fountains — a low-level task often delayed if there’s snow to shovel or heaters to fix. Noah, which Ramos named after his nephew, not only purges the stagnant water and settled contaminants. Chicago treats its water with orthophosphates, a chemical commonly used for corrosion control, and Noah ensures a regular application of the coating to the inside of pipes — so that the water coursing through them never touches lead. Noah, of course, has its skeptics. The device might not work in places like California, where water isn’t as plentiful as in Chicago or Seattle, said Laura Deehan, a public health advocate with consumer group CALPIRG. She advocated for the complete replacement of any old plumbing and fixtures in public schools. CALPIRG has helped school districts working toward prevention, including Oakland, which last year adopted a lead limit of 5 parts per billion. And with the solid backing of voters, school officials in San Diego will tap $45 million from new bond money to get down to 1 part per billion in all water sources. To reach that goal, the district will explore replacing and updating plumbing, according to a school board resolution. According to Christlieb, it would cost between $1.5 billion and $2 billion to replace all the old pipes in the much-older Chicago schools. Noah, with a price tag of about $250 per device, offers a much more cost-effective and scalable solution, he said. “Michael (Ramos) has solved the lead problem in public schools, not just in Chicago,” Christlieb said. A district-approved pilot program will expand Noah to 25 elementary campuses this school year. Christlieb said the results of that pilot will determine whether it’s worth installing Noah at every school in Chicago. Back in Seattle, the district currently spends about $65,000 on its testing and remediation program each year. Despite the program’s mixed results, Staudt suggested there’s no need to invest any additional money on an automatic flushing device like Noah. Although he noted his willingness to consider the pros and cons of a 5 parts per billion standard, Staudt cited a 2014 study that found Seattle’s remediation program practically eliminated water lead levels as a health threat. However, the district doesn’t disable and replace every water source found to have elevated levels of lead. The most common solution to high levels of lead? A sign posted near the potentially toxic fixture, warning teachers and students not to drink from them. 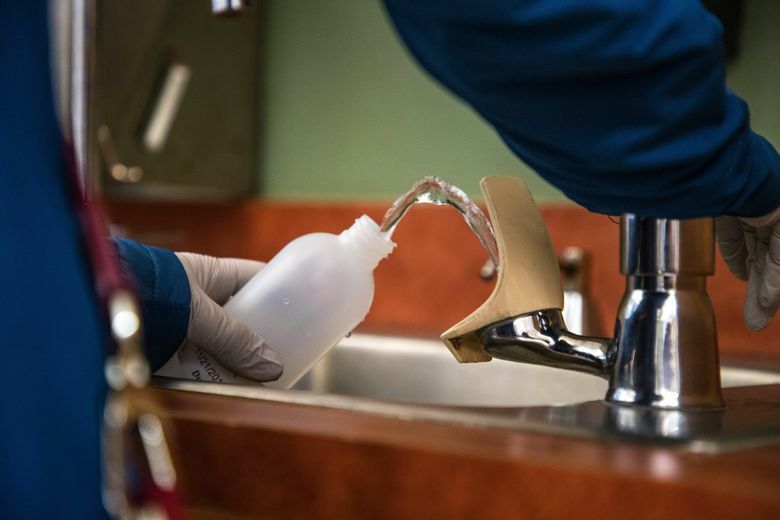 Bruce Speight, director of Environment Washington Research & Policy Center, found it concerning that the district would leave any water fixture — including sinks and faucets — in service after finding high lead readings. The district posted such signs for each of the 26 fixtures at Broadview-Thomson, which Staudt downplayed since high levels of lead — in one case more than five times the district’s limit — were only found in classroom sinks. Before moving to Seattle, she taught bilingual education in Houston schools, and she said many of her students filled their water bottles from the classroom sink. Blakeslee also recalled, during a visit to Rainier Beach High as part of her research, witnessing a teacher fill her coffee pot from a faucet underneath a sign warning her not to drink from it. The logic also seemed to confuse teachers at Emerson Elementary in Rainier Beach, where the district last November sent a central administrator and janitor to collect water samples. In a kindergarten classroom, a teacher asked why they weren’t collecting any water from the faucet in the sink of an adjoining bathroom. “They shouldn’t be drinking from there,” the administrator said. Before she could answer, the administrator left the room.